End Cap to fit end sections of glass balustrade base channel. 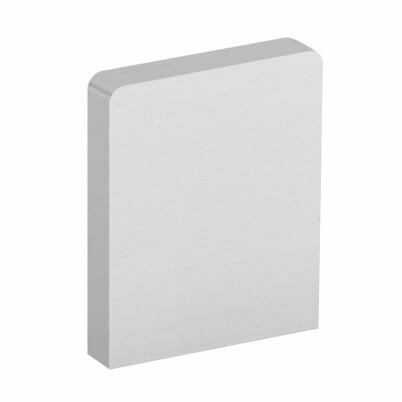 Slim 45 x 35.5mm profile for a clean and stylish finishing touch. Aluminium base channel end cap designed for left or right hand fixing. Designed to fit 43.5mm x 32mm base channels from the 'Hybrid' balustrade range. Manufactured from aluminium with a matt silver finish. High strength adhesive pads allow for a quick and easy installation. Ensure the reception areas are clean from dust and debris. Place end cap into position to create a secure fixing. Base Channel, Glass Mounting Profile.